Carol Bartlett | Morrow County Sentinel Gary Ebert, president of the Cardington-Lincoln High School Alumni Association, is flanked by Clayton Fisher and Jane Perry, who were each awarded a $1,000 scholarship from the alumni association during the annual party. LeAnne Gompf | Morrow County Sentinel Martha Kehrwecker Porter, left, of Ashley and Donna Newcomer Day of Portland, Indiana are pictured at the Cardington-Lincoln High School alumni program. Graduates of the CHS Class of 1935 they were the oldest alumni attending. Friendships were renewed and new ones made when the 85th Cardington-Lincoln Alumni party was held May 23 at the high school. There were 240 diners served a grilled chicken dinner by All Occasion Catering, Waldo. The table grace was given by Larry Gandee, Class of 1965. During the meeting in the Pat Drouhard Auditorium conducted by Gary Ebert, executive committee president, the welcome to the Class of 2015 was given by Lois McElroy Weaston, a member of the CHS Class of 1965. Response was given by Clayton Fisher, president of the Class of 2015. Linda Ruehrmund discussed the compilation of a new directory and asked for volunteers and donations to help with the project. The last directory was produced in 2000. Ebert inducted four graduates into the 2015 C-LHS Hall of Fame. Inducted and giving their responses were Dr. Larry Burggraf, Class of 1954; David Fisher, Class of 1958; and Helen Briggs Geckle, Class of 1939, posthumously. The fourth inductee was Dr. James Murphy, Class of 1956. The association awarded a $1,000 scholarship each to Jane Perry and Clayton Fisher, members of the Class of 2015. Ebert recognized all of the classes in attendance with special recognition of those from the increment years. 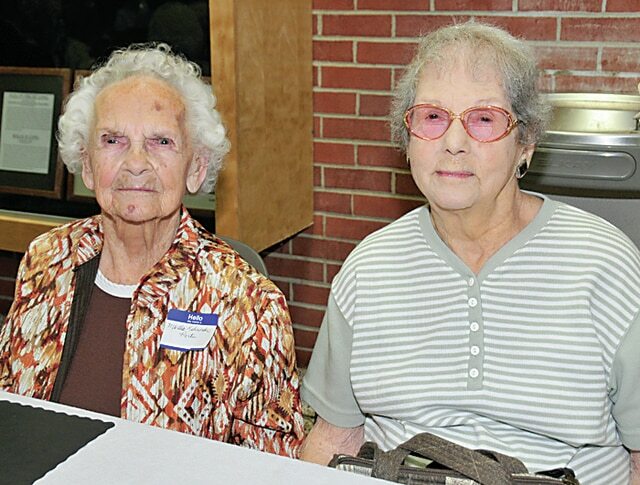 Martha Kehrwecker Porter and Donna Newcomer Day, from the Class of 1935 were the oldest alumni in attendance. Alumni were present from England, Alaska, California, Texas and Florida. Other increment classes recognized included 1945; 1955; 1960, and 1975. The class of 1965, the 50 year class, was introduced individually by Stan Heacock, a member. Each class mate was given a keepsake folder made by Joanne Fricke Mathews, Class of 1952. She also created special gifts for those in attendance who graduated in 1945 or earlier. The memorial service for 48 alumni was conducted by Darlene Ebert Wallace, 1966; Sharon Morris Collmer, 1970 and Carol Ackerman Wahl, pianist, Class of 1967. Remembered with a white carnation each were Russell Patterson, Class of 1938; Helen Briggs Geckle and Juanita Renz Cramer, 1939; Daryl McClenathan and Lloyd Thomas, 1941; Kenneth Deel, 1945; Walter Kelley, Gloria Davis Breece, 1946; Phyllis Shaffer Stover, Walter Yake, Sam Thomas and June Moore Yake, 1947; William “Bill” Philbrook, 1948; Loren Levering, 1950; June Landon Lanum and Glen Saunders, 1951; Lloyd Ruehrmund, Jr., Jerry Decker, Lowell Shaffer and Pat Long Flora, 1953; Robert DeBolt and Jack Williamson, 1954; Harold Schorr, Pat Fowler Shoewalter, Roberta Long McBride, 1955; Eugene Pine, 1957; Gretchen Wetzel Mooney, 1958; John Conaway, Dennis Haycook, 1959; Joan Fleming Shoemaker, Nancy Davis Levings and William Shonk, 1960; Devonia “Dee” Betts, 1951; Jeff Landon, 1962; James Longshore, 1964; Garold Wuertz, 1966; Sharon Cocherl Coomer, 1967; Yolanda Grosh White, 1968; Larry Butler, 1970; Barbara Mermann and Roger Landon, 1971; Brian Cook, 1976; Lawrence “Larry” Collins 1977; Donald Mosher, 1979; Michelle Albright and Mary Lou Ebert Schalk, 1980; Jarrod Morgan, 1984 and Justin Bowersmith, 2010. The meeting closed with the singing of the school song led by Kenneth Heimlich, Class of 1949 and accompanied by Wahl. The evening concluded with dancing and listening to the music of the Palace Theater Big Band from Marion. Handling registration were Jacqueline Mason Winchell, Shirley Fowble Robinson and Juanita Richey Randall, 1953; Twila Rentschler Gardner, 1954 and Vickie Hardman Gould, 1966. Set up crew included Kevin and Sid Long, 1975 and 1977, and the executive committee. Alan Long, 1977, led a tour of the Nichols Street School with 40 people attending. He also served as the custodian for the party. Hostesses were Angie Boyd Dendinger, 1983 and Sharon Morris Collmer, 1970. Hosting the refreshment table were Lydia Edgecombe Pepperell and Jessie Hamon, Class of 2012 and the south technician was Cameron Longstreth. Helping with the directory update was Mary Kay Disterdick, 1964. The next alumni party will be held May 30, 2016. Officers are Ron Pine, president; Gary Ebert, first vice president; Robert Mathews, second vice president; Darlene Ebert Wallace, secretary; Evelyn Fricke Long, treasurer; and Angela Boyd Dendinger and Sharon Morris Collmer, committee members.